This is what I like to think of as a mic drop kind of recipe. 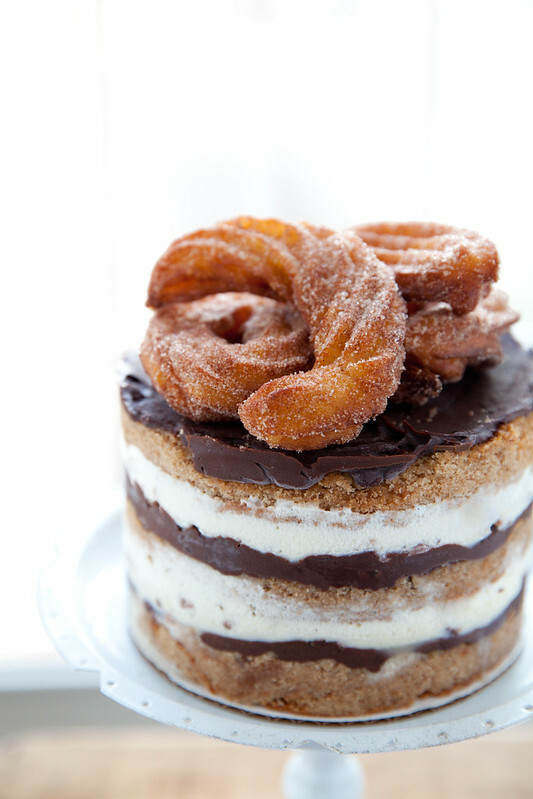 Churro cake. See above evidence. 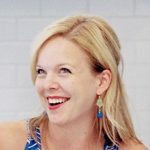 What more is there to say, really? In the interest of pretending you need more convincing, let’s just take a closer look at this beauty, shall we? The whole situation starts with, you guessed it, churros! These serve as both a garnish on top of the cake as well as the base of the churro crumble in between the layers. The leftover cinnamon-sugar from coating the churros is baked into the cake itself, along with brown butter which we already know is one of the best things ever. Add to that layers of dark chocolate ganache with a hint of spice from both cayenne and cinnamon and layers of creamy vanilla ice cream, and we have what is without a doubt the very best birthday cake I have made for anyone ever. Lucky me, it was for my own birthday! Just when I thought I wouldn’t be able to top the vanilla caramel latte cake from last year, I went and made this business. Now I truly am convinced that this cannot be topped and quite frankly, what would be the point in trying? Like I said, mic drop. To make the churros, combine 2 cups of the sugar with the cinnamon in a pie dish and whisk to blend well. Set aside. Combine the milk, salt, butter and 2 teaspoons of sugar in a medium saucepan. Bring to a boil over medium-high heat. Add the flour into the pan with the milk and stir vigorously with a wooden spoon until the flour is fully incorporated and the mixture begins to cook. Remove from the heat and transfer the mixture to the bowl of an electric mixer. Let cool in the bowl for 5 minutes. Turn the mixer on to medium speed and add the eggs one at a time, mixing each until fully incorporated before adding the next. Meanwhile, add the oil to a medium saucepan and heat to 350˚ F. Once the batter is finished mixing and the oil is heated, transfer the batter to a pastry bag fitted with a large star tip. Pipe lengths of batter into the hot oil, filling the pan with a single layer and leaving space between each churro. Let cook, turning once, until golden brown, about 2-3 minutes per side. Remove from the oil with a slotted skimmer and transfer to a paper towel-lined baking sheet. Once cool enough to handle, coat in the cinnamon-sugar mixture. Repeat with the remaining batter. 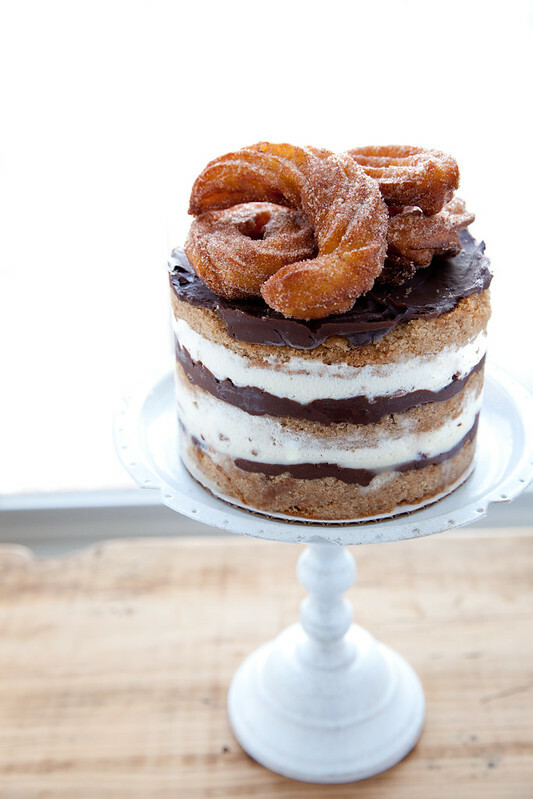 (You will have far more churros than you need for the purposes of this cake but since when was too many churros a thing?) Do not discard the left over cinnamon-sugar mixture – you will use it below in the churro crumble and the cake itself. To make the cake, put the butter in a medium saucepan over medium heat and cook, stirring frequently, until golden brown and aromatic, about 3-5 minutes after the butter is fully melted. Pour the brown butter into a bowl and let cool to room temperature. Heat the oven to 350˚ F. Butter and flour the edges of a quarter sheet pan. Line the bottom of the pan with parchment paper. In the bowl of an electric mixer, combine the browned butter, cinnamon-sugar and brown sugar. Beat on medium-high speed for 2-3 minutes, until fluffy. Scrape down the sides of the bowl, add in the eggs, and mix on medium-high for 2-3 minutes more. Scrape down the sides of the bowl again. With the mixer on low speed, stream in the buttermilk, oil and vanilla. Increase the speed to medium-high and mix for 4-6 minutes, until the mixture is nearly white and twice the size of the original batter, and completely homogenous (there should be no streaks of fat or liquid.) Scrape down the sides of the bowl. With the mixer on very low speed, add in the cake flour, baking powder, and salt. Mix about 45-60 seconds, just until the batter comes together and no dry streaks remain. Spread the batter in the prepared quarter sheet pan. Do not churn the ice cream until you are ready to fully assemble the cake. When you are ready, remove the vanilla pod from the ice cream batter. Freeze in an ice cream maker according to the manufacturer’s instructions. Meanwhile, make the ganache. Place the chopped chocolate in a bowl. Warm the cream in the microwave or a small saucepan just until bubbling. Pour over the chocolate and let stand 1-2 minutes before whisking into a smooth, thick ganache. Blend in the corn syrup, cayenne and cinnamon. To assemble the cake, invert the cake from the sheet pan onto a work surface. Use a 6-inch cake ring to cut out 2 circles from the cake (these will be the top two layers.) Wipe off the cake ring and place it in the center of a sheet pan lined with clean parchment or a silpat. Use a strip of acetate to line the inside of the cake ring. Use scraps from the leftover cake to place in the ring and tamp together in a flat, even layer. Spread a third of the ganache in an even layer over the cake. Sprinkle 1 cup of the churro crumble evenly over the ganache, using the back of your hand to gently adhere it and anchor in place. Carefully spread half of the ice cream as evenly as possible over the churro crumble. Gently tuck a second strip of acetate between the cake ring and the top ¼-inch of the first strip of acetate. 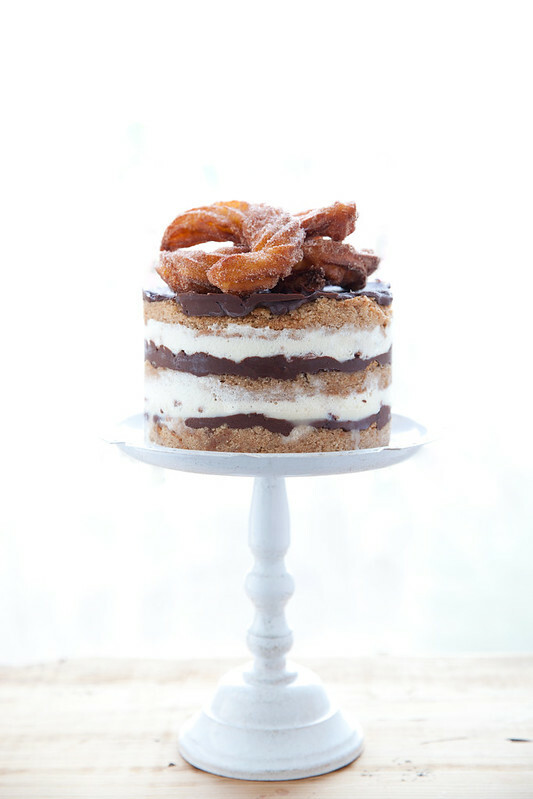 Set a cake round on top of the ice cream, and repeat the layering process once more (ganache, churro crumble, ice cream.) Place the remaining cake layer onto the ice cream. Cover the top with the remaining ganache and garnish with extra churros. Transfer the assembled cake to the freezer and freeze for a minimum of 6 hours to set the cake and ice cream. At least 3 hours before you are ready to serve, remove the pan from the freezer, pop the cake out of the cake ring, and peel away the acetate layers. Transfer to a cake platter and defrost for about 10-15 minutes before slicing and serving.